Hortus Camdenensis | Erica coccinea L.
A rigid, stoutly branched, bushy shrub, the hanging tubular flowers produced in threes on the ends of short side branches. The flower-bearing side branches are closely packed towards the tips of the upright main branches, giving the effect of a spike-like inflorescence. The anthers are yellow-brown and protrude far from the flower tube. This is a variable species throughout its range. To 1.2m. [http://www.plantzafrica.com]. ‘Heath, with beardless tips, without the blossom, and very long; blossom club-shaped, turned inwards and orange coloured; segments blunt and turned inwards; flowers grow by threes at the ends of branches; cup double, tiled; leaves grow by threes, are curved, and reflexed; the branches are quite covered with little branches.’ [Andr.Heaths. v.1, pl.55/1802 as Erica sebana aurantia]. The illustration used here is from this publication. 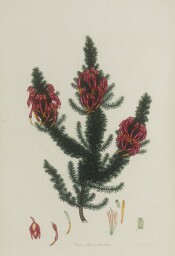 The plant described and illustrated by Andrews as Erica coccinea is Erica abietina ssp. abietina, which see. Conrad Loddiges also made this error of identification [LBC no.1375/1829] and, as Macarthur probably obtained his plant from Loddiges’ Nursery, his plant may have been Erica abietina rather than coccinea. For this reason both plants are included in the Hortus. I am grateful to Alice Notten and Ted Oliver for drawing my attention to this mis-identification and for providing the following historical data. ‘The mis-identification and confusion between the two came about because Linnaeus first named what is now Erica coccinea as E.coccinea (in 1753) then changed his mind and called it Erica petiveri (in 1771), by which name it was known for a while. But according to the code of botanical nomenclature the first name has priority so it was changed back to Erica coccinea in 1950 (by Adamson and Salter, in the Flora of the Cape Peninsula). In 1767 P.J. Bergius described what is now Erica abietina ssp abietina under the name Erica coccinea [Descr. Pl. Cap. p.92/1767], despite the fact that Linnaeus had already described it as Erica abietina in 1753 [Sp. Pl. vol.1, p.355/1753]. Bergius's Erica coccinea was subsequently found to be identical to Linnaeus's Erica abietina and as E. abietina is the older name, and E.coccinea already in use, the name Erica abietina stands.’ [Personal Communication Alice Notten and Ted Oliver, Kirstenbosch National Botanic Garden, South Africa]. Listed in the 1843, 1845 and 1850 catalogues. Marked with a ‘c’ indicating grown at Camden in a copy of Loddiges’ 1836 catalogue held at Camden Park [CPA]. Probably obtained from Loddiges’ Nursery. Erica coccinea was also ticked in a copy of the Horticultural Register, August 1831. Although this originally belonged to James Bowman, nephew to William Macarthur, this perhaps provides further evidence that it was grown, at least by the extended Macarthur family, earlier than 1843. [See also Erica nudiflora L. and Erica bauera Andr. for more background information]. Erica coccinea L. ex Benth. (1838) = Erica tubiflora Willd. Erica coccineus P.J.Bergius (1767) = Erica abietina L.
Erica sebana Donn ex Willd.